A complete virtual desktop infrastructure (VDI) solution should deliver a reliable, high-performing desktop user experience while taming complexity and supporting scalability within a secure, stable framework. IT organizations must approach VDI implementations strategically with these three traits as a priority: performance, availability, and security. The challenge is that VDI places a much greater burden on the corporate network than fat-client solutions, simply because everything on the screen and each keystroke or mouse click must be transmitted to the remote server hosting the virtual desktop image. Managing network resources, optimizing communications, and increasing servers in the data center to host VDI instances means that much of the desktop management burden shifts from technical support to network and server teams. But from a network perspective, VDI is not terribly new. Rather than treating VDI as yet another application that needs to be accommodated by a set of special-purpose network devices, companies should turn to a tried and true infrastructure solution or platform that can support any application at any location at any time. Application Delivery Controllers (ADCs) improve both the performance and the availability of apps that are centrally housed but delivered in a highly distributed environment. 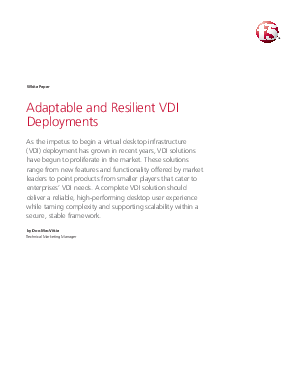 ADCs can play an ongoing, strategic role in accelerating the widespread deployment of VDI.